If your CPU load climbs too high, you will hear clicks, pops or stuttering in the live audio. This is known as a buffer underrun. The good news is, CPU load be lowered if you take the time to make some adjustments to FL Studio as shown below. Why do underruns happen? - Live audio is pre-rendered in small chunks that are then sent to your audio interface. The Buffer length decides how long these chunks are. The purpose of pre-rendering is to even out momentary spikes in CPU load, when your computers ability to generate audio is slower than 'real-time'. In this case, some of the buffered audio can be used while real-time processing catches up. If the buffer runs out, because your CPU can't keep up with real-time for too long, then your audio device will start crackling or stuttering. Underruns only matter during real-time playback - Loading projects and plugins will cause underruns and so the total count should not bother you. Underruns also can't occur in exported wave or mp3 files as the render process can take as long as it needs to generate audio. If you do hear glitches in an exported audio, then it's a plugin behaving badly. Further information is available in the FL Studio Optimization YouTube playlist. Audio settings - For Windows, one of the most important settings is to select an ASIO audio device driver from the Input / output menu. Look first for the native ASIO driver that installed with your audio device OR if one is not available use the Image-Line FL Studio ASIO. Whichever driver you use, download the latest from your audio device manufacturer. NOTE: Do not connect your audio device through a hub. Use a direct USB port connection. USB Hubs - Do not connect your audio device through a hub. Use a direct USB port connection. Mac users - Try Aggregating your audio interface. This often improves unsolvable crackling issues, particularly during recording. The graph shows why very short buffers are bad, and very long buffers don't help - This shows a case where the, theoretical minimum, time needed to generate audio for the project is 50% of real-time. That is, no matter how long the buffer, the computer needs 1/2 that time to generate the audio to fill it (longer buffer lengths don't come for free, as more audio needs to be made). Short buffers are a problem because of 'processing overheads'. That is, there is a minimum time that can't be crossed without the CPU falling behind real-time. 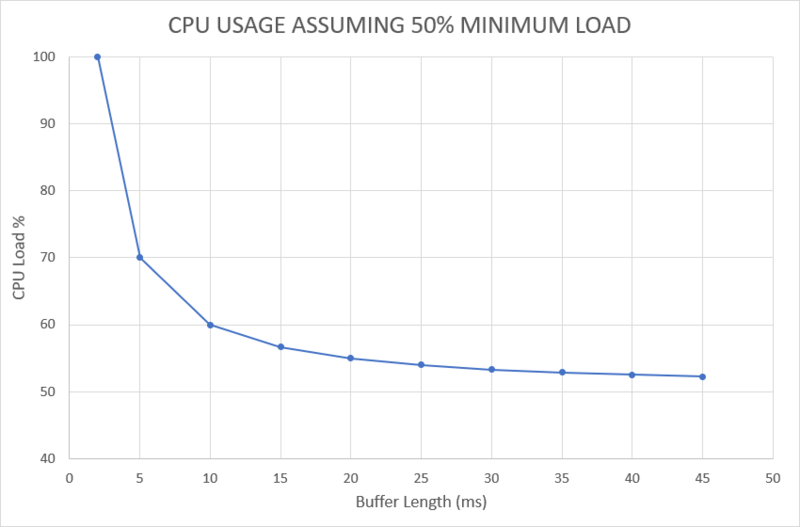 As the buffer is reduced, processing overheads become an increasingly large proportion of the workload, and the CPU meter climbs rapidly, usually below 10 ms, as the theoretical minimum buffer length is approached. Conversely, longer buffers simply converge on the minimum possible buffer-fill-time, in this case 50%. The graph is based on the assumption the processing overhead is 1 ms and the buffer-fill-time is 0.5 x Buffer Length (ms). NOTES: For an explanation on how the FL Studio CPU meter is different from the OS CPU meter, see here. Quoted sample latencies assume a sample rate of 44100 Hz. Windows - 'Start > Settings > Control panel > System & maintenance*** > Power Options'. *** Whether or not this sub-menu shows depends on your windows settings. Set your power management to 'High performance mode'. If you are running a Laptop/Tablet CPU and experiencing unexpected audio glitches or CPU spikes, try Advanced Settings and set Minimum / Maximum processor state to 99%. This can prevent the system going into turbo CPU mode, and then thermal throttling which causes issues. Finally, ALWAYS use a laptop connected to the power supply. macOS - Open 'System Preferences > 'Energy Saver' > (available option depends on your Mac model) Set 'Computer sleep' slider to 'Never' OR Check the box 'Prevent computer from sleeping automatically when the display is off'. Un-check 'Put hard disks to sleep when possible' and 'Enable Power Nap'. Laptops: Open System Preferences > Energy Saver > Un-check automatic graphics switching. Finally, ALWAYS use a laptop connected to the power supply. VST library mismatches - Make sure you are using plugins that match your version of FL Studio (32 or 64 Bit). Some people switch to FL Studio 64 Bit while their VST library is still 32 Bit. If FL Studio can't find 64 Bit equivalents of the plugins it will bridge 32 Bit versions to 64 Bit mode. This uses more CPU than 32 Bit plugin on FL Studio 32 Bit or 64 Bit plugins on FL Studio 64 Bit. Time stretching > Mode > Stretch - If you have a lot of Audio Clips set to this mode, they will consume far more CPU than when set to Resample. Generally, you should only use 'Stretch' mode for Clips that span a Tempo change. Otherwise, use offline stretch modes. Multithread support - Make sure Multithreaded generator processing and Multithreaded mixer processing are selected on the Audio Settings panel AND if you are using VST plugins, 'Allow threaded processing' is selected on the Wrapper. Smart Disable - Enable Smart disable on the Audio Settings and then run the Tools Menu > Macros Switch smart disable for all plugins. This will disable effects & instruments when they are not making any sound and can decrease CPU usage significantly. If this global option causes issues with any plugins it can be disabled for those individual plugins using the wrapper menu setting 'Smart disable'. NOTE: Smart Disable is active only during live playback, it is temporarily disabled when rendering. Create multi-core compatible projects - Make sure that your highest CPU using plugins are routed to independent Mixer Tracks without shared 'Send' Channels. Multi-core CPUs need computational tasks that can be run simultaneously and so split across cores. Each Mixer Track represents an 'opportunity' to create these independent, parallel, processing paths. Each unit in the audio chain from the instrument through to the Mixer track and the effects must be processed in sequence on the same core. If one mixer track is linked to another, then all the instruments and effects on both Mixer Tracks now have a dependency and can't be split across cores efficiently. Symptoms of this situation are audio glitches as individual cores max-out and cause underruns while the overall CPU load still appears to be low. Update to FL Studio 20.1 or later. We made some dramatic improvements to CPU load starting with FL Studio 20.0.4 and more since then. Buffer length - Make sure your buffer is not less than 10 ms (441 samples). We recommend between 10-40 ms.
Mixer Interpolation - Should be set no higher than 24 point sinc (lower is better). Sample rate - Set to 44,100 Hz (or 48,000 Hz if that is not available). Sample rates such as 192 kHz and 96 kHz, will use significantly more CPU than the recommended default of 44.1 kHz. Reset plugins on transport - Make sure 'Reset plugins on transport' is disabled as this can cause significant glitching on start/stop events when using VST plugins. Priority - Set to 'Highest' and deselect 'Safe overloads' (don't worry, an 'unsafe' overload will just lock up interface controls momentarily). ASIO Options - Try the Mix in buffer switch and Triple buffer options. NOTE: If these do not help, make sure to deselect them again before proceeding. Smart Disable - Enable Smart disable on the Audio Settings and then run the Tools Menu > Macros Switch smart disable for all plugins. Consolidate patterns - Use the Playlist Track (header) Right-Click menu option 'Consolidate this track' to convert your highest CPU usage patterns to Audio Clips. PPQ setting - The PPQ setting sets the event resolution for the current project. Settings above 192 PPQ can have a significant impact on CPU load. Generally use 96 PPQ unless you need the extra temporal resolution. For projects heavy with audio-tracks - Turn OFF 'Keep on disk' for any Sampler and Audio Clip channels. This ensures samples are pre-loaded into memory avoiding underruns caused by disk-to-RAM swapping delays OR zoom out the Playlist, (Ctrl + Right-Click) on a blank area, so all Audio Clips are visible prior to pressing Play. This forces Audio Clip data to be cached into RAM. Reduce the plugin count - Try to reduce the number of plugins (instrument and FX). These are the most CPU hungry parts of the program. Limit Polyphony - Use the maximum polyphony setting to reduce the maximum polyphony of channels (see Miscellaneous Channel Settings). This often reduces dramatically CPU usage in complex melodies. You can still set FL Studio to ignore the maximum polyphony settings when exporting to wave/mp3 file (see Exporting to .wav/.mp3/.mid). Disable MIDI - Disable all the 'Enable MIDI...' options using the Options menu as MIDI processing uses CPU resources even when not in use. Playlist sluggishness - Try disabling 'Playlist menu > View > Keep labels on screen'. Mac users see here. Plugins behaving badly - See this section of the manual. Competing & background programs - Close all non-essential programs that may be competing for resources, e.g. Instant messaging programs (AIM, MSM/WLM, Skype, Yahoo! Messenger), torrents, web browsers, audio/video players, etc. If you experience intermittent issues, check for scheduled activity like virus scans, backups, windows updates, disk defragmentation, even Wi-Fi & Blue-Tooth adapters have been known to cause issues, particularly if they are constantly re-making flaky connections. Hardware issues - Unplug unused HDMI, USB, BlueTooth & FireWire devices if you are experiencing unexpected CPU spikes and glitches to discount these as causes. Driver issues - Update your Audio driver, Video driver and Motherboard BIOS in that order, checking each time if the issues go away. Make sure to use the latest driver from the manufacturers website for your operating system. Extend your memory - Check the manual page on the CPU & Memory panel. Adding more physical RAM can improve responsiveness where data was previously saved in the Page File. This is only likely to help if you are using 4 GB or less. Weak - 4,999 or less. Medium - 5,000 to 9,999. Strong - 10,000 to 14,999. Very strong - 15,000 or more. If your CPU is in the 'weak' or 'Medium' categories, show it respect, don't throw 30+ high-cpu load plugins at it and wonder why it chokes. Audio processing, as performed by DAW software, is one of the most CPU intensive tasks done in real-time on computers today. It's more CPU intensive than 3D games, that offload a lot of work to the video card GPU. Each audio stream needs real-time calculation of at least 44100 samples PER second multiplied by the number of plugins you are running multiplied by their own internal shenanigans. But, all hope is not lost, limitations breed creativity, work with what you have and rejoice in the democratization of modern music production. If you would like to upgrade your system, we have a detailed Knowledge Base article here on Building an Audio Production ready computer. Having the lowest Buffer length setting is not a competition. If you are happy with 20 or 30 ms then that's great. Remember, the lower the buffer length setting, the higher the CPU load. We strongly recommend 10 ms (ASIO mode) as a minimum setting. At lower settings than 10 ms, most people don't experience improved 'responsiveness' and the CPU load climbs rapidly. To put 10 ms in context, the delay between pressing a key on a real piano and the hammer hitting the strings is in the order of 80 ms and the time taken for that sound to reach your ears is a further 3 ms, something to ponder.